(a) Membranes called meninges enclose the brain and spinal cord. (b) The meninges include three layers: dura mater, arachnoid mater, and pia mater. Pia mater. Arachnoid mater. Dura mater. 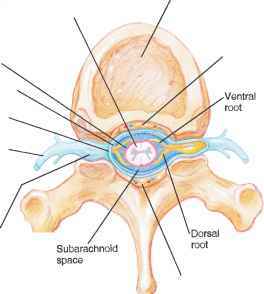 (a) The dura mater ensheaths the spinal cord. 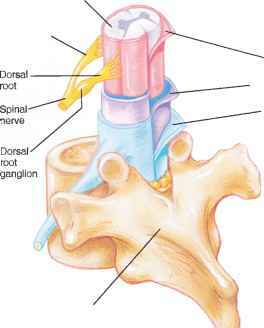 (b) Tissues forming a protective pad around the cord fill the epidural space between the dural sheath and the bone of the vertebra. The arachnoid mater is a thin, weblike membrane that lacks blood vessels and is located between the dura and pia maters. It spreads over the brain and spinal cord but generally does not dip into the grooves and depressions on their surfaces. 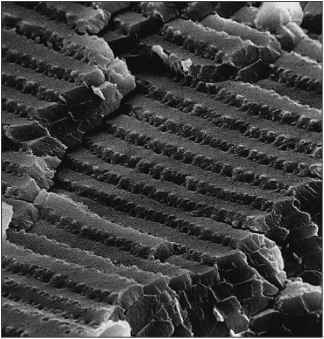 Many thin strands extend from its undersurface and are attached to the pia mater. Between the arachnoid and pia maters is a subarachnoid space, which contains the clear, watery cerebrospinal fluid (ser"e-bro-spi'nal floo'id) or CSF. The pia mater is very thin and contains many nerves, as well as blood vessels that nourish the underlying cells of the brain and spinal cord. The pia mater is attached to the surfaces of these organs and follows their irregular contours, passing over the high areas and dipping into the depressions. Meningitis is an inflammation of the meninges. Bacteria or viruses that invade the cerebrospinal fluid are the usual causes of this condition. Meningitis may affect the dura mater, but it is more commonly limited to the arachnoid and pia maters. Meningitis occurs most often in infants and children and is considered a serious childhood infection. 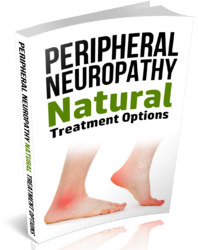 Possible complications of this disease include loss of vision or hearing, paralysis, mental retardation, and death. Name the layers of the meninges. Explain where cerebrospinal fluid is located.